"The most engaging so far of this year's many fine piano trio albums, Burrell's new Expansion (High Two) is a crowning achievement in his long and eventful career. While leaving plenty of space for William Parker's bass and Andrew Cyrille's drums, Burrell crams a century of jazz history into every chugging stride episode and churning dissonance. Encyclopedic as well as ecentric, he's a living treasure." "Number 2 Jazz album of 2004: The best of the year's many piano trios, with William Parker and Andrew Cyrille pacing a veteran eclectic whose stride on 'They Say It's Wonderful' is, and whose karate clusters elsewhere persuade you it don't mean a thing if it ain't got that ping." "His new trio with bassist William Parker and drummer Andrew Cyrille bridges the entire span of his music and brings it to life with exceptional vibrancy. The whole jazz tradition echoes throughout the collective free improvisation on the title track." "Expansion is an outstanding jazz collage of pounding raw piano chord chunks, beautiful sprinting tonal lines, calculated piano flitter meanderings, bottom-end rumbling disjointed-walking jazz bass lines and expressionist/explorative drum work." "Veteran pianist Dave Burrell personifies the best of neoclassicism-uncompromising individuality and in-the-moment gusto." "No one is willing to admit that (Burrell) is precisely trying to create new standards of achievement, while at the same time a century of African American music and blues of yesteryear keeping ready to surface at any touch of his fingers." "Often while his left hand plays boogie-woogie, or classical blues,his right hand expresses new sounds with great effects. It is really a gift to the Great Black Music and Black Classical Music..."
"Few composers integrate avant-garde experimentation and conventional swing with this much graceful blaster." "Burrell's knowledge of the piano and of its jazz literature is nearly encyclopedic. 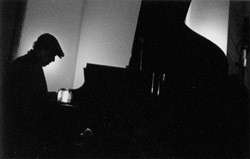 His modern single-line ragtime pieces, like AM Rag and Punaluu Peter trace the lineage of players like Monk back far beyond the Harlem stride pianists." 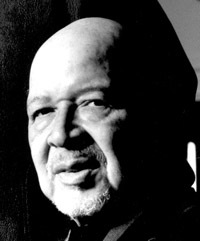 "Dave Burrell's unaccompanied recital of new compositions astonished with his range of expression and emotional depth. His sound was admirably fat, his articulation was incisive." "Dave Burrell, a consistently insightful pianist who writes engaging melodies (a rare talent) and interprets Jelly Roll Morion as a valued muse. ...is a scintallating solo performer." "..pianist Dave Burrell reeled off spinning treble swirls that sounded like 29 wind chimes in a hurricane." "Dave Burrell's solos are pianistic pearls"
"Burrell, who's been shockingly neglected, was here with his knowledge of the whole history of black music and thrilling control of the keyboard." "Burrell's piano performances of his own recent works communicate the joy of a man totally involved in an activity he loves."